Brigadier General John Joseph Wermuth, Jr., veteran of the Korean fighting and four World War II campaigns, attended the Army War College at Carlisle Barracks, Pennsylvania from 1952 to 1953. Colonel Wermuth earned the Legion of Merit for outstanding service in Korea from June to December 1951 as Executive Officer and Commander of the 7th Regiment, 1st Marine Division. In World War II he fought in the defense of Pearl Harbor and the Bougainville, Peleliu, and Okinawa campaigns. He was awarded the Bronze Star Medal for meritorious service in September and October 1944 as Assistant Logistics Officer of the 3d Amphibious Corps at Peleliu, and the Letter of Commendation Ribbon for services in the same capacity at Okinawa from April to June 1945. The General was born 6 June 1913 at Beacon, New York, and graduated from high school at Poughkeepsie, New York in 1936 He then entered Cornell University, where he was a member of the ROTC for four years. Graduating from Cornell in 1936, he was commissioned a Marine second lieutenant on 1 July of that year. Upon receiving his commission he was ordered to the Officers' Basic School at the Marine Barracks, Philadelphia Navy Yard. He completed the school in March 1937, and the following month, joined the Marine Barracks Detachment at the Navy Yard, New York. In June 1938 he was ordered from New York to Quantico, Virginia where he served for two years with the 5th and lOth Marine Regiments. He also participated in the Caribbean maneuvers of 1939 and 1940. In June 1940 the colonel joined the Marine Detachment of the USS New Mexico to serve for a year in the Pacific. In July 1941 he took command of the Marine Detachment aboard the USS Argonne, and was serving in that capacity at Pearl Harbor when the Japanese struck on 7 December 194h He returned to the States in June 1942. In August 1942, after serving briefly as commander of a 155mm howitzer battery at San Diego, California, he entered the Army Field Artillery School at Fort Sill, Oklahoma. Completing the school in October 1942, he served for three months as Assistant Operations and Training Officer of the 12th Regiment, 3d Marine Division, at Camp Dunlap, Miland, California. He was named inspector and transport quartermaster of the 3d Marine Division at San Diego in January 1943, and embarked with the division the following month for the Pacific theater. Geneeral Wermuth became the Assistant Logistics Officer of the 1st Amphibious Corps in August 1943, serving in that capacity at Bogainville in November 1943. The 1st Corps redesignated the 3rd Amphibious Corps in April 1944, and Colonel Wermuth served as the Assistant Logistics Officer until his return to the United States in August 1945. For the next two years the colonel served as a Logistics Officer in the Supply Section, Division of Plans and Policies, Headquarters Marine Corps, Washington, DC. During this tour of duty he also served temporarily with the U.S. Navy Mission to Brazil in August and September 1946. The colonel left Washington in August 1947 to enter the Senior Course in the Amphibious Warfare School at Quantico, Virginia. Completing the course in May 1948, he remained at Quantico to serve for three years as an instructor in the Logistics Section. Arriving in Korea in June 1951, General Wermuth served as the Executive Officer of the 7th Marine Regiment until September 1951, when he became its commander. In March 1952 he was promoted to his present rank, and returned to the United States to serve at Headquarters Marine Corps, Washington, DC, until he entered the Army War College in August 1952. Colonel Wermuth was advanced to the rank of Brigadier General 1 August 1956. In addition to the Legion of Merit, Bronze Star Medal, and Letter of Commendation Ribbon, all with Combat "V", his medals and decorations include the Presidential Unit Citation with two Bronze Stars; the American Defense Service Medal with Fleet Clasp; the Asiatic-Pacific Area Campaign Medal with four Bronze Stars; the American Area Campaign Medal; the World War II Victory Medal; the Korean Service Medal with one Bronze Star; end the United Nations Service Medal. 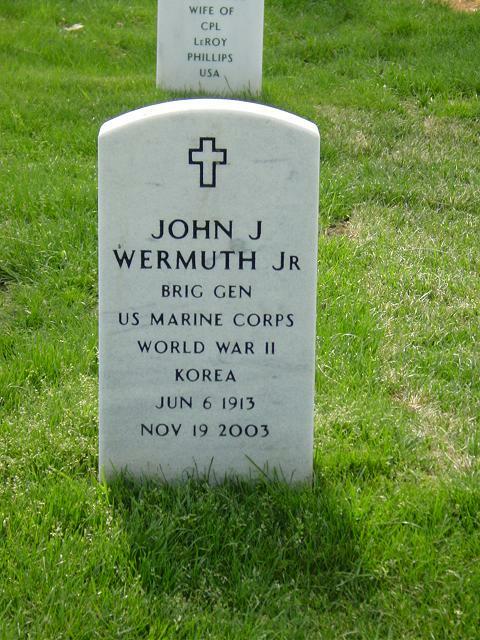 Brigadier General Wermuth and his wife Treva(deceased), have one son John J., III.